Shorties's Kingdom 2 (yes, that is how the developer spells it) is a strategy game that you can play in your web browser. 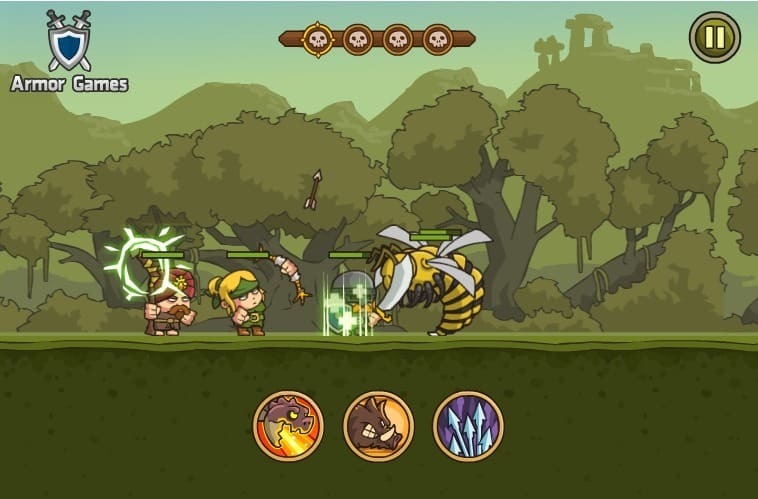 It is a relaxing browser game as you control the band of heroes indirectly only in the game; so, no selecting and moving characters around and ordering them to attack specific enemies. The game introduces you to all core concepts in the first couple of levels. You start with the warrior hero and rescue the archer and wizard in later stages of the game. Shorties's Kingdom 2 displays a map on start; use it to enter the next battle, buy weapons and armor, spin the wheel for some goodies, or spend keys that you collect while playing for some rare artifacts that may take your heroes to the next level combat-wise. Combat is the meat of the game and it has a laid back approach as mentioned earlier. The characters walk automatically from left to right and when they encounter enemies, will hit them automatically using their weapons of choice. The fighter tanks most of the damage, the archer makes most of the damage, and the mage heals the other two. Your only option during combat is to select the right special action at the right time. Special actions depend on the equipment of the characters. The fighter may cast a shield to protect against any damage for a short period of time, the archer may rain down arrows on enemies, and the mage may summon a dragon to roast them. The right use of special actions is usually what wins a battle. The game throws different enemy types and bosses at you: some hard hitting or tanks, others ranged or with wide swoops that hit all your characters. 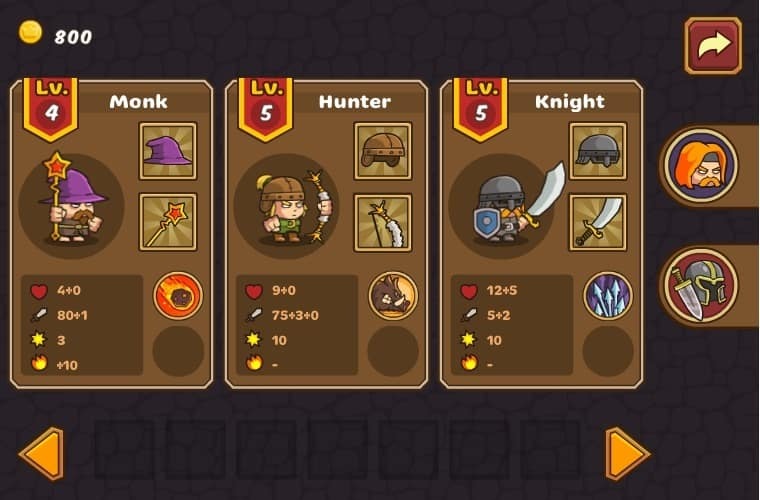 Your characters earn experience points for each battle regardless of whether they are successful or not; this leads to level ups that improve base stats. You earn a key if you are successful, and may spend 3 or 7 keys to unlock treasure chests that reward you with special items that are more powerful than the common items that you can buy in store. 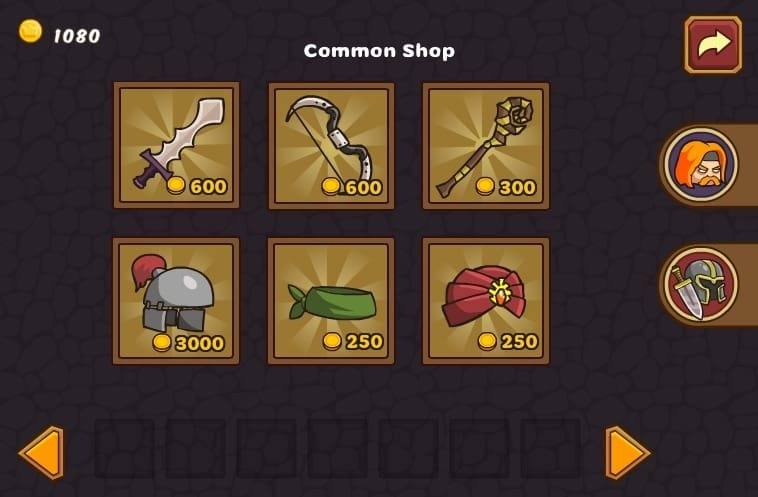 Spend money that you earn after battles in the common shop to buy more powerful weapons and armor. Equipment sells for the price that you bought it. Note that you cannot buy equipment again once you have sold it though which may limit the special actions that you have at your disposal. Not a big problem while you play the game but once you have bought the most powerful items and sold the rest, you are stuck with the special actions that they give you. The first couple of items that you can buy in the common shop come with one special action only. All items afterward support two so that you end up with a total of six different special actions that you may activate during combat. Special actions work only if characters are still alive. The character screen displays levels, stats, and current equipment. Use it to drag and drop items to slots to equip them. The game has a total of five regions which you visit twice over the course of the game. Multiple battles happen in each region and you may only proceed if you win a battle. You can replay previous battles of the same region, however, for instance to collect more money or experience. Buy equipment as soon as you have enough money for it. It makes your characters stronger. The right timing for special actions is the most important part of any battle. Activate shields or snares when hard hitting enemies approach, use area damage specials for groups of enemies. You may want to hold on to those keys and tickets that you get. The reason is simple: you get better stuff later on. Don't sell equipment when you bought the highest tier of items. If you do sell it you won't get it back and can't switch to using these specials should the need arise. Shorties's Kingdom 2 is a short relaxing game. You won't break a sweat in the game as it requires little attention when you play it. Hitting the right specials at the right time is all you do. While that may not sound appealing to Starcraft 2 Pros, it is worth a try for anyone else who does not mind a lack of controls if the game itself is appealing. The game is quite short and even inexperienced gamers should not have troubles beating the game. The final boss is tougher than the rest but beatable as well with the right timing of specials. Now You: Do you play browser games? What is your favorite game currently?